These are PV's that are known to exist or are under restoration. If you know of any further vehicles or can update the details below please let us know. Restored in white and green. Used regularly at shows and events. Has not been reported for many years. Restored in ELVA racing livery. Was rebuilt in the late 80's, sold to a signwriting company during the late 90's as a promotional tool. Fell into disrepair and purchased by Vallance family. Sold circa 2007. It is now believed stored. Restored some years ago but not seen for many years. Former Egg delivery van - purchased semi restored by D Blanchard, Spilsby. Fully restored. Owned by Mr G Mitchison. Ice Cream van - Fredericks, Chesterfield. Ice cream van, was an ambulance. Restored original Police Van. Used in film work. Theakstons Ales. Restored several years ago and based at Masham Brewery. Fell into disrepair and not seen for many years. Restored and used at events. Restored from just a chassis in 2009 by Vallance family. Restored in 1999 by the Vallance family. Restored as a replica police van in 2006. Restored in the early 1990s in original Home office colours however it has not been seen for some years. Restored Mobile shop - now in Hull Streetlife museum. Now under restoration on the Isle of Man with Mr H Brand. This pair of PV Vans were sold at auction in 2014 - they are now said to be in Scotland. Pair of former ambulances. Currently for sale on Ebay in Dover. Nov 2015. In need of full restoration. VME320 seen in November 2014. Currently for sale. OTHER VEHICLES - These vehicles were recorded as being in existence several years ago however have not been seen recently. If you cajn confirm there existence please let us know. 1950 WMX107 - Sitting case ambulance believed to have been in a container in a Hertfordshire scrapyard. 1949 MWA83 - Last known to be behind an unknown property in a derelict state. 1951 FVH767 - Based on a Land-rover chassis. Not seen for some time. 1951 HAY628 - Van with high sides. Somewhere in Somerset. For sale in 2003. 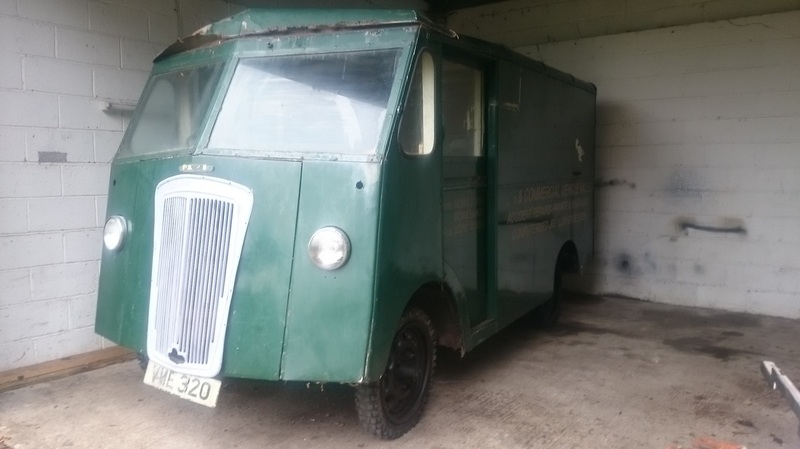 1950 LYH191 - This van was sold at auction in 1998. Believed to be somewhere in Cornwall. 1952 JHD712 - Believed to be under restoration in the early 1990s. 1949 FUF446 - for sale in Dover, 1999. Unrestored. 1950 LPO450 - Believed to be under restoration. MUA340 - AVV994 - FUO898 - All these vehicles have not been noted for some time but could exist. 1952 LYO607 - Police van - Not seen for many years. 1953 - RTV247 - Believed to be under restoration. 1950 NCV400 - No know information.